There are many reasons to spend more time with family, but the most important one must be that it makes us happier and healthier. This much we know for sure. The more time we spend with our loved ones, the longer our lives. But where in the hubbub of daily urban life can we find a place to retreat to with the whole family? Where can we find the blissful feeling of finally being at home? We all have fond memories of childhood bike rides down quiet sandy paths, no cars in sight, just an abundance of nature and fresh air. Playing outside in your own yard, being able to unfold your wings freely and spending quality time with beloved family pets. Is this pure nostalgia? No. Places like this are rare, yes, but they exist – in Hamburg's Nienstedten! The most beautiful of the five suburbs on the Elbe, Nienstedten lays great importance on its community and the personal relationships nurtured within. Children grow up in a first-class neighborhood, safe and well-prepared for all that life has to offer. Real Nienstedters get together in the excellent schools and clubs of the neighborhood. Lifelong friendships are made while playing golf, hockey and polo or going sailing. The wonderful atmosphere of this neighborhood is carried over into its charming urban villas and, by extension, its families. On each floor, generously sized rooms open up like a dream. This generosity of space is elemental to harmonious family life and crucial for a high standard of living. Children have their own domain, parents have room for relaxation and guests are welcome at any moment in the grand living spaces. The promise inherent in these family villas is that children are given the space to grow up safely and without a care in the world, giving them the perfect springboard for their future. With their gently curved mansard roofs, reddish-brown peat-fired brick and white multipane windows, this ensemble of four townhouses and one villa bears unmistakable echoes of local architectural traditions and blends seamlessly with the surrounding villas. Accessed from Charlotte-Niese-Strasse, the spacious townhouses, which have shared driveways and side entrances, are ideal for families with children, offering bright and airy living spaces including an inviting dining kitchen and a separate parental suite. There are also practical features such as a lower ground floor fitness room, an integral garden-level garage and a further basement storey, all of which helps to keep these carefully planned homes free from the familiar clutter of trainers and sports gear. The single detached villa, which stands beneath an old lime tree and is accessed from Gerstenbergstrasse, makes a perfect home for the larger family, offering up to five bedrooms, an impressive 420 square metres of usable floor/ living space and the kind of brilliantly thought-out accommodation you rarely see in a Nienstedten new-build. 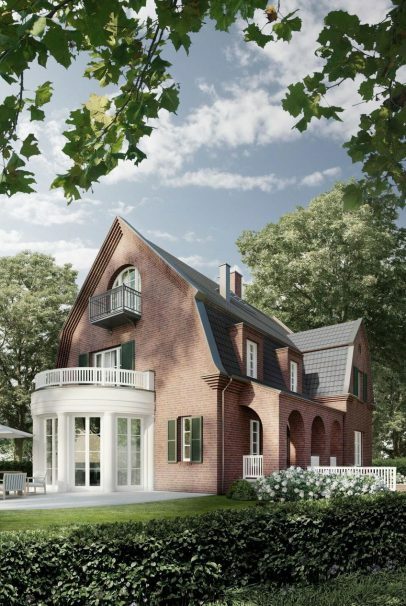 Architecturally, it boasts the same great qualities as the townhouses, while the romantic bay window and adjacent terrace overlook a south-facing garden in which mature trees afford ample shade for al fresco summer brunching. Once a farming and fishing village, Nienstedten today offers residents all the benefits of truly family-friendly living – a first-class suburban location with good transport links to the city centre, quiet streets, excellent nurseries, and schools within cycling distance. What’s more, there are numerous clubs, a variety of leisure activities and an attractive range of shops all within easy reach.